I recently purchased the 2014 edition of County and Municipal Government in North Carolina, edited by Frayda Bluestein and published by the UNC School of Government. It’s a large, 807 page textbook with no index or glossary. In other words, it’s all useful information and well worth the $125 price tag for anyone interested in local government in our state. In my opinion it’s a must read for anyone holding or planning to run for a seat on a county or municipal board in North Carolina. Before going any further I need to make certain that readers understand a few terms. In North Carolina all municipalities are organized as cities, towns, or villages, but in the eyes of the state these terms all mean the same thing. 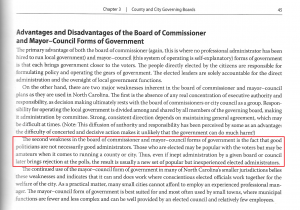 Likewise, the governing board of any town in North Carolina can be called a city council, a board of commissioners, or a board of aldermen, all refer to the same thing: a body of elected officials who meet to set policy for a city. When I refer to municipal councils or boards below, readers should understand that those terms are interchangeable. There are two forms of municipal government used in our state: mayor-council and council-manager. The mayor-council form, where a mayor handles most administrative duties while the council sets policy, was the original form of municipal government in America, established during colonial times. As cities grew systems of patronage emerged, leading to corruption, political favoritism, and inefficiencies. In response, during the early decades of the twentieth century the council-manager system developed as an alternative to the mayor-council system. Today the council-manager form of government is the primary form for most mid-sized American cities with populations between 2,500 and 250,000, while the mayor-council system – with many variations in the powers of the mayor – is more common in small towns with populations below 2,500 and larger cities of more than 250,000 residents. The town of Ramseur, North Carolina is currently organized as a mayor-council form of government. In North Carolina municipalities are established by charters enacted by the state legislature, but cities may alter their forms by ordinance or amendment of their charters in accordance with North Carolina General Statutes (GS). If a town wishes to move from the mayor-council form of government to a council-manager form, GS 168A-148 stipulates that the manager be given hiring and firing authority over all employees not otherwise hired by the council. Ramseur dabbled with hiring a town administrator in the recent past. This did not require a change in the form of government, as no charter amendment was required. 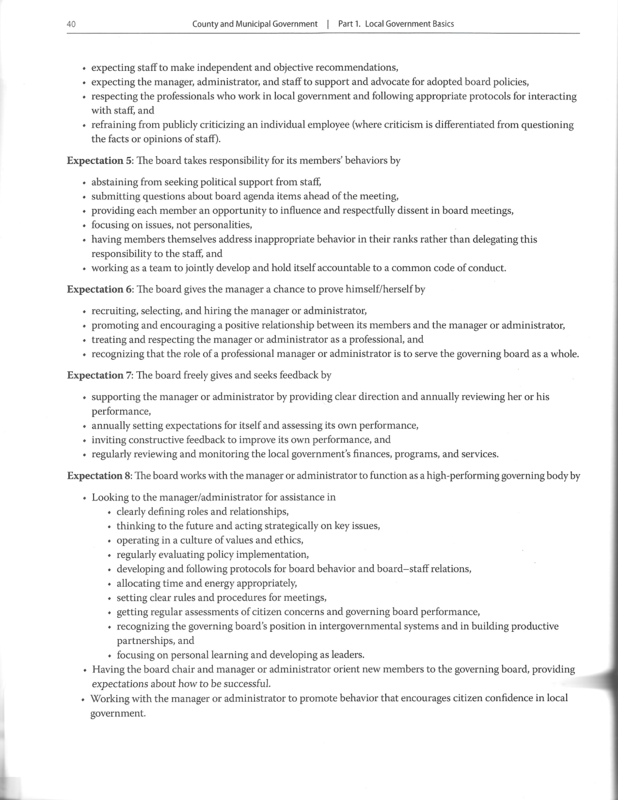 Hiring an administrator allows a board to retain more authority, such as hiring and firing, and to play a more active role in administering local government. By statute, the powers of a mayor in North Carolina consist of presiding at council meetings, voting to break ties at said meetings, and signing documents on behalf of their city. That said, many mayors in North Carolina do have great influence over the administration of their towns. It is not uncommon for a town council to delegate to a mayor additional duties such as representing the city on regional advisory boards, helping to craft council meeting agendas, or serving as the primary media contact and spokesperson for the town. Most powers held by local mayors are created by municipal charters or by action of a city council. GS 160A-69 recognizes the mayor as the head of a city for purposes of serving civil process, and this is typically recognized by most state and federal agencies in civil matters. The same statute requires the mayor to preside at all council meetings, while GS 160A-71 affords the mayor powers to call special meetings of the council. In small towns without a manager the mayor is often seen as the de facto chief administrator, and while this might seem like a natural choice, GS 160A-151 makes it illegal for the mayor or any other member of the council to serve in this role, even temporarily. The governing board of any city holds ultimate authority to act for the local government in any capacity not expressly forbidden by statute or delegated to higher authorities such as county, state or federal agencies. Town councils decide what services will be provided and at what level, and establish fiscal policy by adopting an annual budget ordinance and setting municipal property tax rates. Local governing boards also adopt all citywide ordinances and manage numerous other administrative matters such as the purchase and sale of city property and contract negotiations. Board members may only act when properly convened in accordance with open meeting laws; no individual member of the board nor the mayor may act unilaterally unless given specific prior authorization from the board. Under a mayor-council system of government, the council is responsible for establishing or abolishing any departments deemed necessary or desirable. Typically, these departments include police, fire, water, streets, sanitation, recreation, planning and inspections, though some services may be contracted or shared with county government, at the board’s discretion. A town council appoints department heads who are typically afforded the authority to hire/fire employees under their supervision. In cities with populations under 5,000, the mayor or council members may serve as department heads and receive reasonable compensation, but in cities where population is greater than 5,000 this arrangement is prohibited by law. Councils also have the right to combine the responsibilities of several departments under one person. 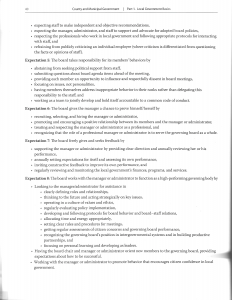 For example a public works supervisor might be appointed to direct both streets and sanitation, or a public safety director may be appointed to oversee police, fire, and other emergency management services. 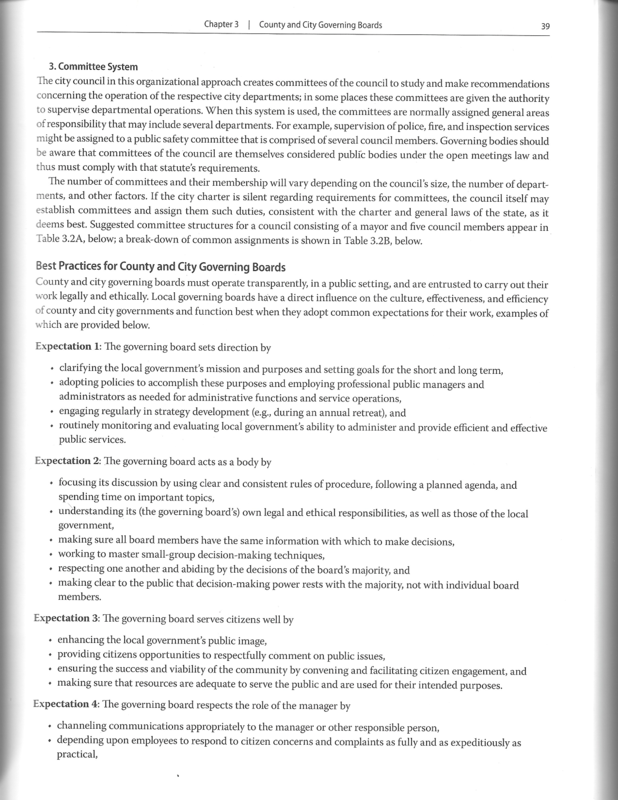 In organizing and directing the various functions of city government, a council may use one of several organizational plans, unless the city charter states otherwise, but the council always has the power to alter the city charter within statutory limits. 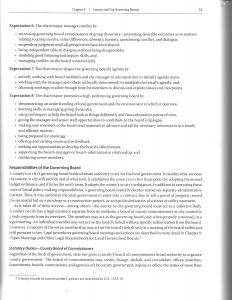 Whatever administrative plan is used, it is imperative that the council define the responsibilities of each department head; coordinate as far as possible the activities of each; establish clear lines of authority between the council, department heads, and employees; and establish a workable plan enabling the board to adequately supervise all municipal services to the satisfaction of the community it serves. The three administrative methods used by towns operating under a mayor-council system are: (1) the entire council supervises all departments as a single body, (2) one council member is assigned to supervise each department, and (3) subcommittees of the council supervise one or more departments. Under the first option, a council appoints all department heads, who then look to the full board for direction. This plan can be difficult to sustain and is usually best suited to small towns with no more than three or four departments to manage. The second option – each department assigned to a specific council member – is how Ramseur currently operates. Under this system each department is assigned to a specific board member who exercises administrative control at the direction of the board. 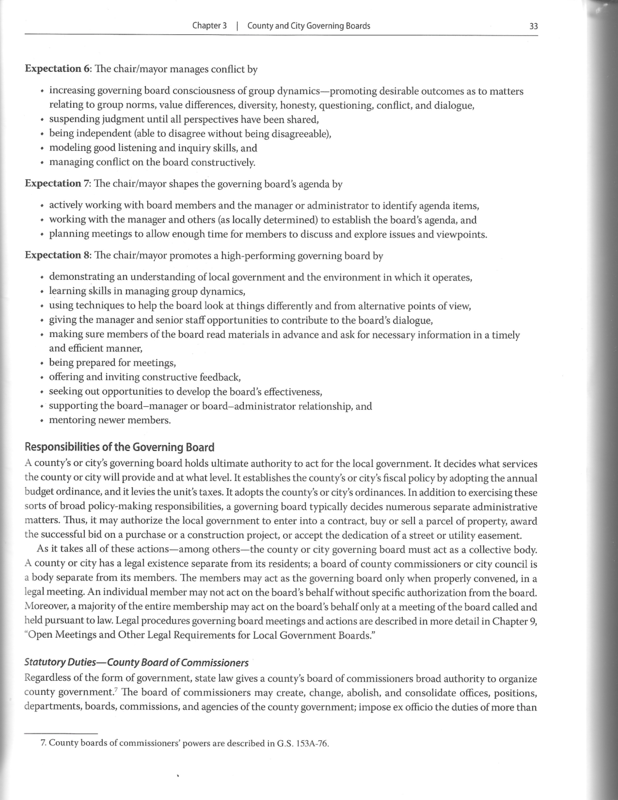 Department heads report directly to the assigned board member, but personnel decisions are usually reserved to the full board. One of the drawbacks to this system is a tendency for some council members to become more concerned with their respective departments than with the overall operation and administration of all city services, which is the council’s principal duty. 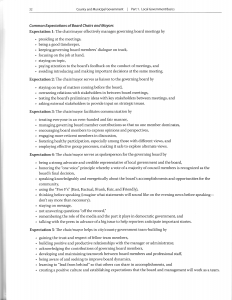 The third option – a committee system – creates subcommittees of the council to study and make recommendations regarding the operation of respective departments. Under this system, committees of two or three members are assigned general areas of responsibility that may include several departments. For example, water, sewer and sanitation might be assigned to a public health committee. Committees such as this are considered governing bodies and as such must operate within the same open meeting laws the full board is bound to. If a municipal charter is silent with regard to committees a council may establish them as long as they remain consistent with the municipal charter and any applicable statutes. While this synopsis is admittedly oversimplified in places, readers should now have a general idea of what ought to be expected of elected officials and how they should behave in office. Look for other articles like this in the future as time permits. 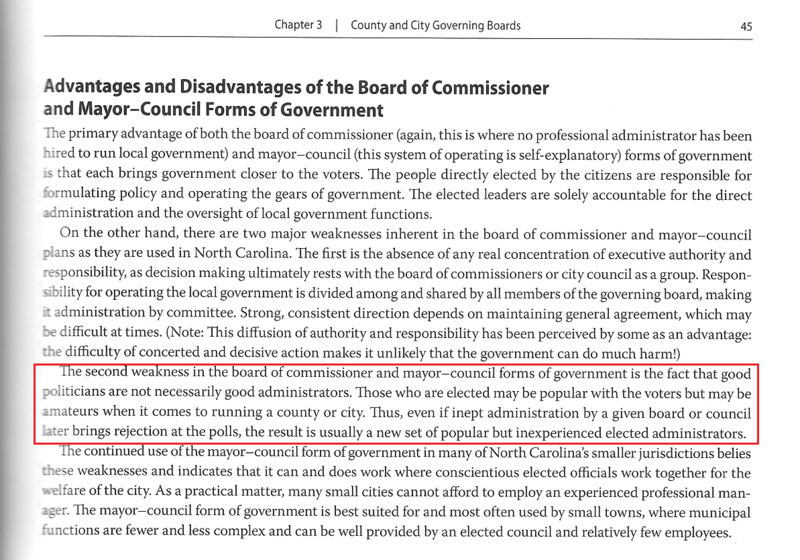 Source: County and Municipal Government in North Carolina, Second Edition, Chapter 3 – County and City Governing Boards, by Vaughn Mamlin Upshaw, faculty member, UNC School of Government.